Birthday cake. A rainstorm. A discussion of Nietzsche. A man and his child watching a train pass. A wedding. Flowers piled on the dashboard of a car. An infant basking with cats in a sunbeam. Dogs wagging their tails in the snow. Friends sharing a bottle of wine in the park. Making and enjoying scrambled eggs. An old time printing press. Ballet lessons. A game of chess. A hot dog vendor on a wintry day. A spider web. A curtain billowing in the breeze. A lazy afternoon naked on the bed. Petting a pony. A flock of birds taking flight. Getting a haircut. An Italian street festival. Backyard barbeque. Rolling down a grassy hill. Savoring a bag of plums. A snowball fight. These are just a handful of the brief glimpses of beauty that Jonas Mekas shares in his epic 5-hour document. The old comedy cliché is that when someone wants to show off his home movies, the guests all groan in anticipation of an evening of boredom. 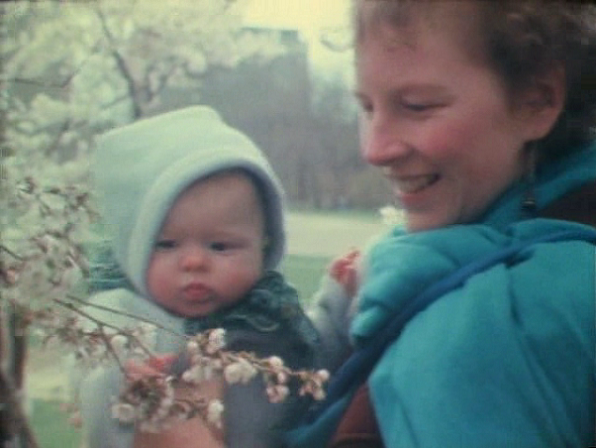 But Mekas elevates the home movie to ecstasy. “I do not make films, I just film” he humbly proclaims. But part of filmmaking happens at the editing table, and Mekas assembles his footage into a whirlwind of rhapshodic memory. The pieces of film are chopped up, sped up, superimposed… flashes of scenes that come rushing over you like a rushing river of nostalgia. “Fragments of Paradise” he calls them. Indeed. It is a personal, intimate portrait of a full, rich life. If there is a dominant theme to the movie, it is to enjoy the comforts of friends and family. Mekas has numerous friends, and as an influential figure in the world of avant-garde cinema, they include people like Ken Jacobs, Hollis Frampton, Peter Kubelka, Stan Brakhage and Allen Ginsberg. But the most everpresent personalities in this film are his wife, Hollis, and his children, Oona and Sebastian. The love he has for his family is all over the screen, you can’t help being swept up in it. As someone who does not (yet) have kids, more than any other this film makes me feel what I’m missing. And as a cat lover, I especially enjoyed the shots of Duffie and Sunshine. If this all sounds terribly mundane, Mekas acknowledges that. Among the crude title cards that are repeated throughout (“Life goes on”, “I am trying to remember” and most enigmatically, “This is a political film”) is “Nothing happens in this film”. On the soundtrack — between snippets of classical standards, recordings from the sources, rock/pop songs (Velvet Underground! ), the lovely piano score by Auguste Varkalis, and accordion music by the director himself — Mekas often injects his own off-the-cuff musings, in his thick, warm Lithuanian accent. He notes that there is no drama, no tension, that it is a film about nothing. I disagree. It is true that there is no conflict, no crisis. No fear, no pain, no death. But it is full of joy, love and wonder. There is a Malickian sense of awe at the world and all its simple pleasures. It also serves as a snapshot of New York City in a certain era (although the footage spans three decades, the bulk of it is from the 70’s and early 80’s). Not the romanticized, urbane vision of Woody Allen or the gritty world of Martin Scorsese, but a more down-to-earth New York, vibrant with life and personality. In one of his voiceovers, Mekas voices his delight in New York summers, walking the streets… and later he’s equally effusive about its winters, and notes that in his paradise, there would definitely be snow. The film has a roughness to it. Images are jittery, sometimes dark or out of focus. The soundtrack shifts gears abruptly. It is organized into twelve “chapters” but without any apparent rhyme or reason… not thematically or chronologically. It all adds to the poetry of it, the feeling that memories come flooding into you in imperfect clusters. This entry was posted on April 13, 2013 at 9:52 pm	and is filed under Movie Reviews. You can follow any responses to this entry through the RSS 2.0 feed. You can leave a response, or trackback from your own site. How’d you watch this? I’m definitely intrigued.